Anna and I were recently brainstorming topics to share with our readers. She mentioned her clients often ask her how to make a good salad and suggested I write a post about salads. So, I thought I’d go ahead and share my family’s Favorite Everyday Salad. We all love salad in our house! But that hasn’t always been the case. It’s one of those examples of food I kept serving even though the girls didn’t touch it for years. They’d eat apples dipped in mustard vinaigrette or cucumbers and carrots dipped in dressing, but no salad. 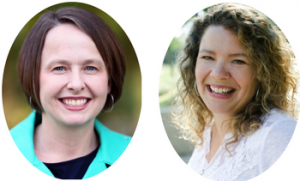 I followed (and still do) the Ellyn Satter Division of Responsibility that Anna talks about in Family Feeding – The Long Haul. Letting kids decide what and how much they’ll eat of what’s offered allows kids to use their internal and intuitive cues. We’ve always told Caroline and Ellie if they’re worried they won’t like a new food they can just take a very small taste of it. They can even spit it out if they don’t like it. Some children have strong taste and texture sensitivities, or worries about new things, that it helps them feel less afraid if they have an out. This is the salad we eat ALL THE TIME. I’ve fallen into making it because I don’t have to think about it. I have the ingredients around and I know everyone likes it. It’s so easy to fall into just making what we know our children will eat. I love Anna’s post last week, What Are Parent’s To Do? 3 Nutrition Actions To Promote True Health. It’s a great reminder to keep feeding my girls foods I want to expose them to and not just foods I know they’ll eat. It’s time for me to branch out and offer some different salads and some new dressings. I can promise you, there will be some grumbling and some wasted salad, but that’s OK.
Ok-now back to salad! It’s a blank slate. A salad can be any combination of items you like. What are the fruits and vegetables your family likes best? Cut them up, toss them together in a big bowl and add your favorite salad dressing. 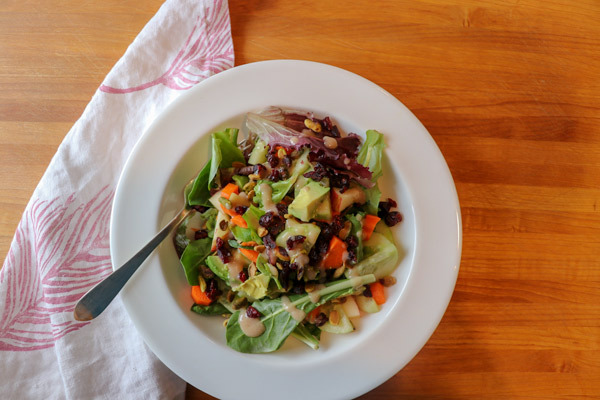 My family’s Favorite Everyday Salad comes together in a few minutes. I make this salad at least a couple of times a week. 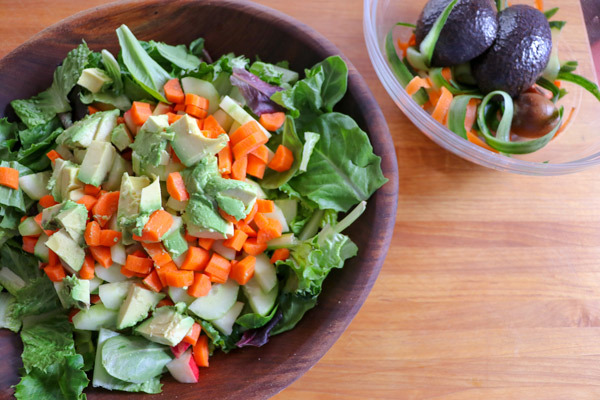 If I was organized, I’d make a big salad once a week and add the apples and avocado just before serving. 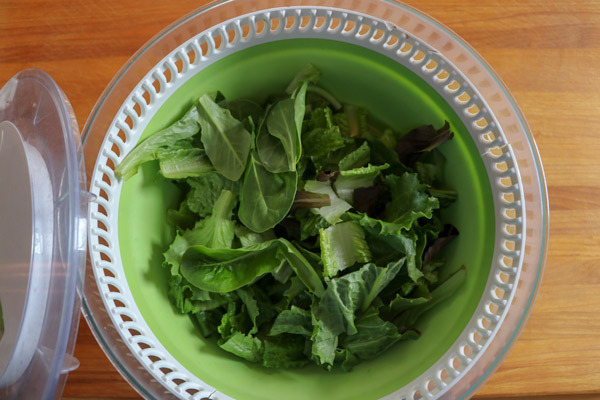 TIP: If you place a paper towel in the storage container with the salad, it will absorb the moisture and prevent the salad from losing it’s crispness. Maybe I’ll do that this week! Sometimes we use a Newman’s Own dressing but I usually make the dressing. 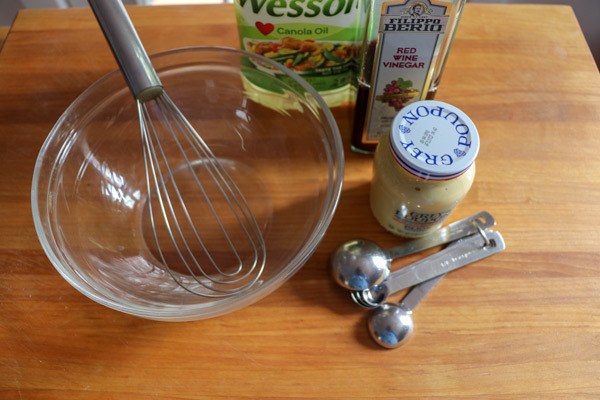 My family’s favorite salad dressing is a mustard vinaigrette I make that takes about 5 minutes. I have included the recipe below. 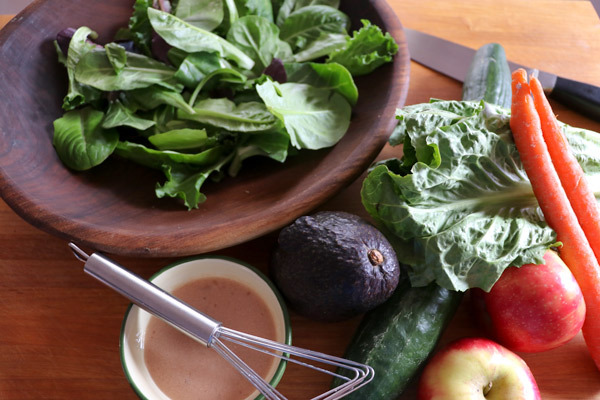 What’s your favorite salad dressing? I often use mixed baby greens with a head of chopped romaine. You can buy it chopped or cut your own. 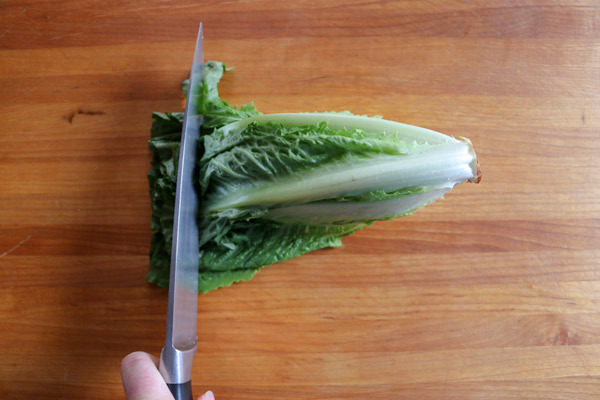 If have a head of lettuce that needs to be cut, I take off the outer leaves. 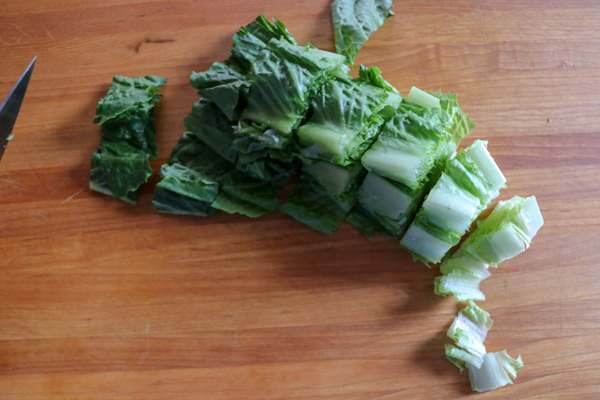 Then cut off the very top of the leaves and next make 3 cuts along the ribs of the lettuce. Turn it after each cut. 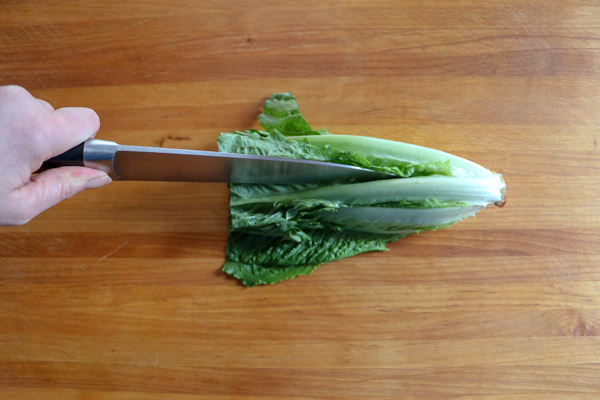 Then cut across the head of lettuce. Next wash your lettuce in your salad spinner. Kids seem to enjoy helping here by trying to get the spinner to spin as fast as possible! Next core and halve an apple (or 2). 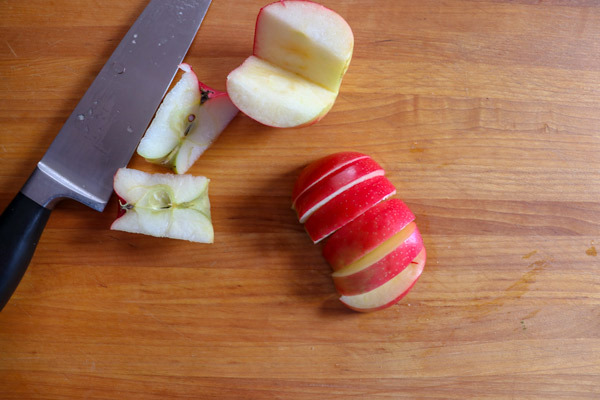 Then set the apple cut side down on your cutting board and slice it. 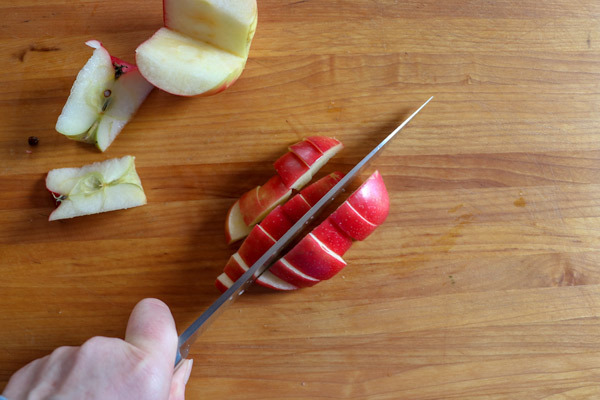 Then cut across the slices. Peel your cucumber and carrots. I keep a bowl nearby and then dump all the peels, etc in the compost bin. 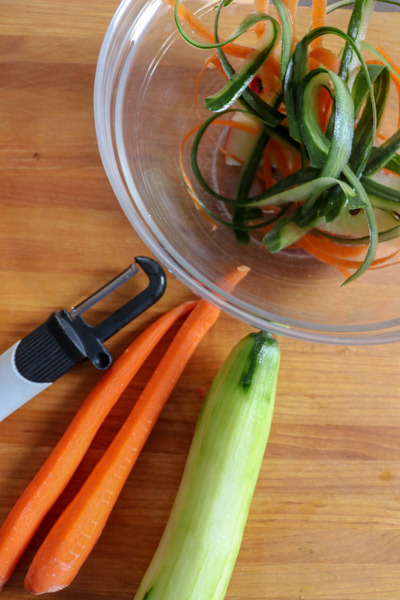 Cut your carrots and cucumbers the same way you did the apples. 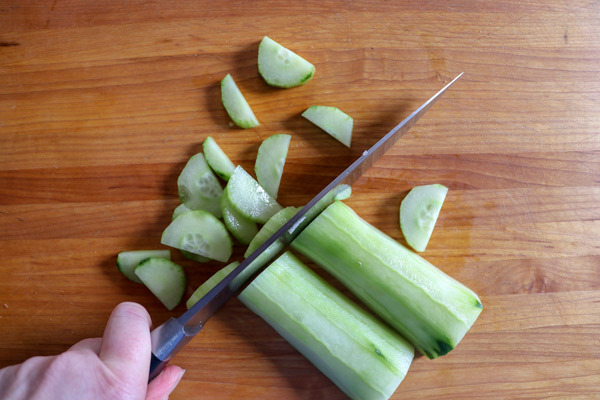 Cut them in half and lay them cut side down on your cutting board and chop. 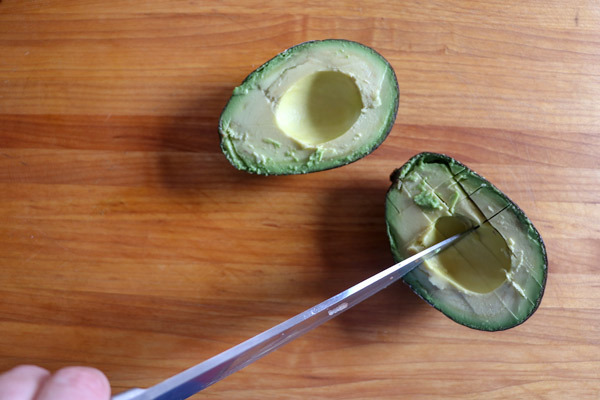 Cut your avocado in half and remove the pit. (Once I learn to make videos, I’m going to make a video of how to pit an avocado). Then score the avocado through to the skin both lengthwise and crosswise. 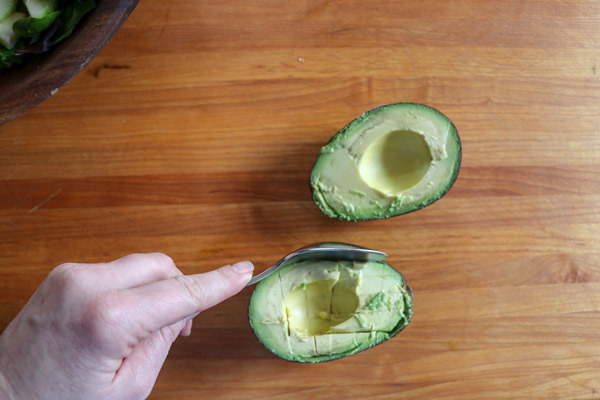 Using a spoon, scoop the cut avocado out of the avocado skin. Toss the salad and serve! We serve the salad tossed with the dressing. (Even though there’s a bowl of dressing in the photo below.) I like the dressing evenly dispersed as opposed to getting bites of salad with no dressing which is what happens if you dress the salad after it’s on your plate. 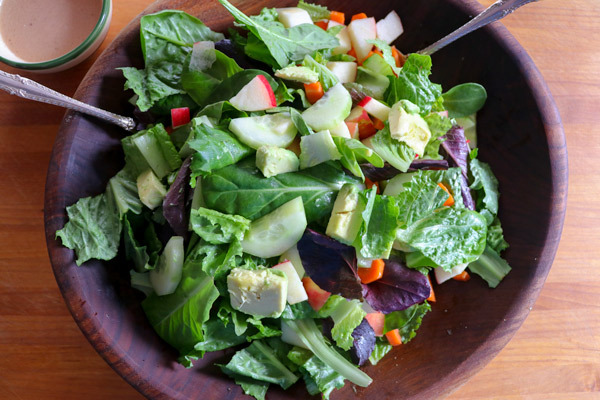 Do you toss your salad with dressing or serve the dressing on the side? 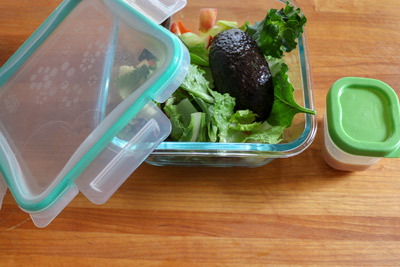 Recently, Caroline and Ellie have been asking for salad in their lunches. Worried about how to keep the avocado from turning brown? I cut the avocado, put a little dressing on it and leave the skin on and place it cut side down on the salad. Then they can scoop out the avocado when they’re ready to eat. I also like to add ingredients I have on hand to make this salad more filling or turn it into an entree salad. Serve it with some crusty bread (or soft if that’s what you like) to complete the meal. 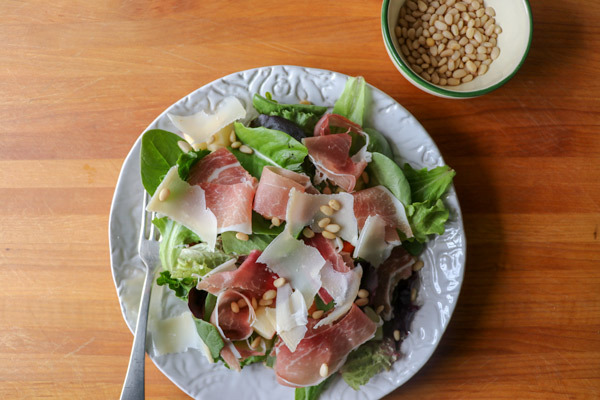 Try making the 3 P salad: prosciutto, parmesan and pine nuts. What kind of dressing you ask? Mustard vinaigrette of course! YUM! Caroline, my almost 14 year old, likes to add pistachios and dried cranberries to our Favorite Everyday Salad. And once again, we use the mustard vinaigrette. Three salads and one vinaigrette! All are great lunch salads. Or breakfast or dinner for that matter! I’d love to hear if you make any of these and what your favorite salads and dressings are!